The BEA released its report today on international trade for January, and what will likely get the most attention is the fact that the monthly trade deficit increased to $46.3 billion from $40.3 billion in December. There will be lots of commentary and hand-wringing today about the "bad news" that America's trade position, trade gap or trade deficit is: a) widening, b) worsening or c) deteriorating in January. What you probably won't hear much about is the good news that total U.S. trade (Exports + Imports) increased to $381 billion in January, reaching the highest level since August 2008, almost two-and-a-half years ago. "Politicians and commentators love to focus on the deficit, as though it were a scorecard of who is winning in global trade, but the real measure is the total volume of trade. As economies expand, so does trade, both imports and exports. Exports help us reach new markets and expand economies of scale, while imports bless consumers with lower prices and more choices, while stoking competition, innovation, and efficiency gains among producers." MP: The good news about the January report is that imports, exports and therefore total trade are all increasing, in another positive sign that the U.S. and world economies are expanding, recovering and growing. this seems like a bit of an oversimplified analysis. february import volumes are going to be up dramatically in dollar terms. however, much of that will be driven by the spike in oil prices. oil imports will not be up in real terms, they will just cost a great deal more. that is a negative for the economy, not a positive. you can't make these sorts of generalizations from nominal trade levels until you separate price movement from unit volume. Total Trade obscures many issues and one of them is higher imported oil prices sending ever more money out of the economy. Back then we called it GNP. I understand this is still taught. If this is true, does not running a trade surplus (ala China) make your GDP larger, and running a trade deficit make your GDP smaller? Also, does this chronic trade deficit shift working capital to China away form the USA? There is a global capital glut now, so I am not sure how important capital is anymore. 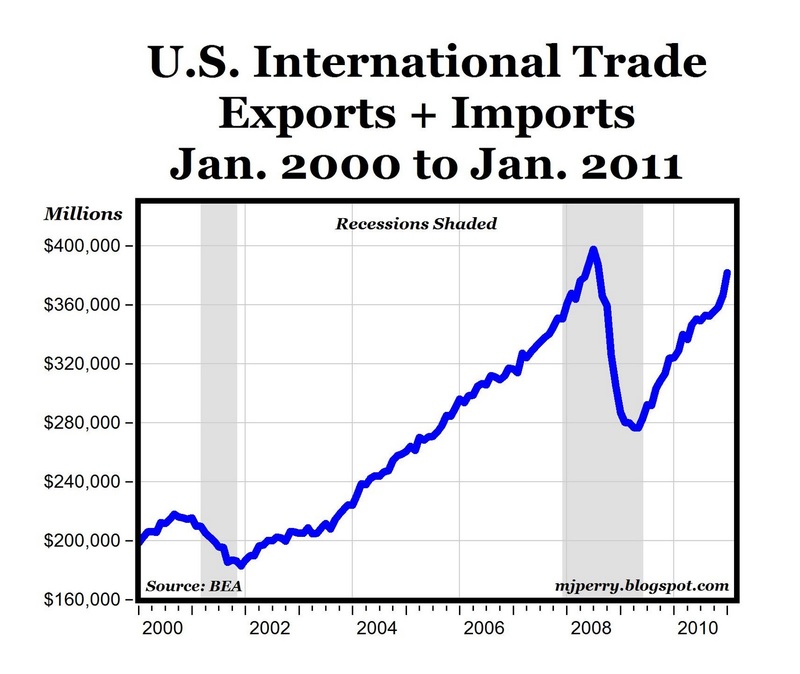 Still, it seems to me that trade deficits shrink our economy. you are likely to have a trade deficit with your local electric company for your entire life. is that destroying your working capital or is it unsustainable in any way? does your personal economy shrink from the purchase of electricity? i doubt it. i suspect it is a vital input to your business. "trade deficit" is a meaningless term tossed around by protectionists and exporters seeking subsidies. you're the one who is so enamored of loose money. what do you care if foreigners help keep our interest rates low? If I run a chronic deficit with everyone I do business with (in aggregate), and chronically borrow money, yes I would be worried. I have lived that way for several years, and I was worried. Does that not now describe the United States? someone else holding the money you paid them is not the same as a debt nor does running a constant trade deficit. wealth comes into the US economy internally as well as from trade. if you have an apple tree that grows 100 apples a year and you give 2 to foreigners and run a constant international deficit, how does that bankrupt you? you still have the other 98.
you still make a profit. you still increase your wealth. are you arguing that the US is running out of money, wealth, or goods? if i buy something from you for $1, i am better off, as i valued it at over $1 or i would not have bought it. so how is it i am suddenly worse off if you are a foreigner? besides benji, you are the big "print money until the presses break" guy. who cares about exporting money? if i give a dollar to my friend in china, it's not a debt. it's paid. i got something for it i valued more. that's the end of it. if they never bring it back to spend, so what? "trade deficit" is not the same as being in chronic deficit with everyone. most US commerce is internal. so we are not in chronic deficit with everyone we do business, you are just looking at a tiny part of the economy and assuming it stands for all. 2010 trade deficit was $498bn. 2010 gdp was $14.6tn. so trade deficit was 3.4% of what we made. if you earned $100,000 and spent $3400 on a party in honk kong, so what? you are not in deficit nor accumulating debt. you are getting wealthier. you cannot exclude domestic economic activity from your "aggregate". "2010 trade deficit was $498bn." That figure represents tremendous jobs potential for the U.S. economy. If we are are sure of the benefits of international trade then, the jobs would be export related. It also reprensents enormous capital exchange. if i buy something from japan because it is cheaper, that leave me more money to spend here. if i then incorporate it into a product and sell it here, i get more profit or the customer gets a better price. if china holds our bonds with the cash they accrue, that lowers US borrowing costs and thereby US budget deficits, tax rates, and effective interest rates. that drives economic activity. this is not nearly so simple a system as you are describing. you seem to be making the case that china investing in the US is a bad thing. that seems a very difficult premise to defend. since when should we discourage investment? further, take your "lost jobs" idea and iterate it a bit. should hawaii make its own cars and michigan grow its own pineapples? should Massachusetts care about its trade deficit with the other 49? should the rest of massachusets care about its trade deficit to boston? where does such a thing end? in economic terms, our national boundary is just an arbitrary line. you cannot look at the US as a unitary actor. the US does not have a trade deficit. a large group of individuals made economic decision based on their own best interest. who are you to tell them with whom they should engage in commerce (or worry about it)? it is the nominal nautre of trade deficits that is tripping you up. you have to think in real terms. we buy from abroad because we find the good to be better value. (they are better or cheaper). if we shift that purchasing to the US, we lose selection and increase costs. so, while we capture a nominal gain, it is offset by a loss in consumer purchasing power in real terms. the "capture" of business and jobs you describe is not actually possible in the way you describe. First, the graph does not show total exported and imported GOODS. It adds-in exported and imported SERVICES. Second, the month-by-month data is modified via mystical seasonal adjustments performed by the Bureau of Economic Analysis. Third, the dollars are NOT adjusted for inflation. If the graph is adjusted to current dollars, the Jan 2000 value becomes $256,000 millions rather than $200,000 millions. Fourth, the graph is not adjusted for population growth (all other things being equal, more people should generate more trade). If you change the graph to goods traded per person, corrected for inflation, and without seasonal adjustments, the slope is much flatter and the extent of the recovery is less. morganovich, you cannot deny that if the trade balance of $498 billion was instead U.S. Exports, that this would create substantial jobs and economic activity. This is much better then a transfer of the ownership of capital (macro) by a trade deficit. I don't argue against international trade but rather, for closely balanced trade. Buddy says "I don't argue against international trade but rather, for closely balanced trade." How do you suggest the U.S. narrows its trade deficits? Reduce U.S. income (or give away U.S. income to our trading partners), create trade barriers, disallow offshoring, replace the dollar with a foreign currency? Why trade a good for another good, when you can receive that good for free? "Why trade a good for another good, when you can receive that good for free?" Free? Wal-Mart will have almost zero revenue because their wares have no cost. Free? There is no trade deficit, because all imports have zero cost. Free? There are no economic problems because everything is free if, U. S. residents buy only imports. Buddy, WalMart will make bigger profits from cheaper (or free) imports. When you can buy 11 units for the price of 10, then one unit is free. Americans can consume the work of foreigners and then work on producing more valuable goods. The U.S. cannot be punished for better economic policies than its trading partners, including open markets and free trade. If someone is willing to sell you something for half price, you may not buy twice as much. You may buy three times as much (given your budget constraint). So, you'd "import" three units for $15 and "export" one unit for $10, creating a $5 trade deficit. However, you really exchanged your $10 good for three $10 goods, or $30, i.e. a $20 surplus. Yet, your trade deficit is measured as $5. I earned $167.70 from my employer and I spent $214.10 but I am better off than I was last month when I earned less and spent less. I don’t get it but I am beginning to understand that Alice's Adventures in Wonderland should be required reading for anyone dealing with free traders. "morganovich, you cannot deny that if the trade balance of $498 billion was instead U.S. Exports, that this would create substantial jobs and economic activity"
i can and do absolutely deny it. you are looking only at those specific products and missing the fact that to shift that production to the US will increase prices not just for those products replaced, but for all the similar products that were made and sold in the US before. those increase prices mean that other consumption must be forgone to pay for them. this works just like a tariff. no matter what, you lose economically imposing one. if i came to you and said "buddy, you must use bob the plumber because he is from our town" despite his rates being much higher that those of others in the next town over, you'd be furious, both at your loss of freedom and you loss in buying power. it would also cause the other local businesses in your area to lose out as you'd have less money left to eat out or pave your driveway. That view is perfectly consistent with the myths of free traders but is inconsistent with the real world experience of the United States. From 1800 to 1900 tariffs averaged 30 percent. The highest tariffs in the world. During this time Americans had the highest wages in the world and at the same time the lowest prices. Your basic fallacy is that you are assuming that price is directly proportional to cost of production. The price is set by the market. The seller is a price taker not a price maker. As American industry moved production overseas to get reduced cost of production with cheaper labor the price did not decline until their competitors also moved overseas. "From 1800 to 1900 tariffs averaged 30 percent. The highest tariffs in the world. During this time Americans had the highest wages in the world and at the same time the lowest prices." Wait! wait! If Americans had the lowest prices in the world, why were tariffs necessary? This is the same tired thing you include in almost every comment. Can you explain how this worked, when in fact, it's easy to demonstrate that a tariff always, without exception, harms the imposing entity? Please don't say that Americans prospered, so it must have been tariffs that caused it. US sugar tariffs keep US sugar prices at about twice those of the rest of the world. let's say sugar in the US costs $6/lb as a result. we still do not produce all our own sugar, so some is imported. if we eliminate the tariff, then the price drops to $3. this benefits US consumers by $3 X N where N = sugar consumed. it harms US sugar producers by $3 X (N - I) where I is the amount we were importing. so long as I > 0 (and it must be else why have a tariff) then dropping the tariff has a net positive effect. that extra 3N can be spent on other goods here and more than covers the harm to sugar growers. The reverse is true when a tariff is imposed. Growers benefit by $3 x (N-I) where I = amount imported whereas consumers are harmed by $3 x N. More than the benefit to growers. It seems obvious that the benefit to consumers minus the harm to procucers is positive. How can this be a bad thing? Do you see any problems with the formula? "Your basic fallacy is that you are assuming that price is directly proportional to cost of production. The price is set by the market. The seller is a price taker not a price maker." Everyone except Marxists understand that price is set by the market. "As American industry moved production overseas to get reduced cost of production with cheaper labor the price did not decline until their competitors also moved overseas." On what do you base this odd notion? Why would anyone move overseas to reduce production costs unless they could gain a competitive advantage by charging lower prices? "That view is perfectly consistent with the myths of free traders but is inconsistent with the real world experience of the United States. From 1800 to 1900 tariffs averaged 30 percent. The highest tariffs in the world. During this time Americans had the highest wages in the world and at the same time the lowest prices. " this is a silly, oversimplistic view. there are other factors at work as well. tariffs ALWAYS result in a net loss for the imposing economy. go back and look at the post from a day or so ago that demonstrates graphically why this must always be so. you are just taking coincidence and calling it causality. the drag of tariffs was simply overcome by other favorable conditions. remember smoot hawley? take a look at how badly that hurt the US economy. i think you'll find that you are deeply mistaken about the facts here.
" The seller is a price taker not a price maker."" neither the buyer nor the seller has all the power. either one can break the deal. that's how the market works. the market is the confluence of buyers and sellers. it's not some external force that can exist exogenous to either. you can try to set the price of a car at $20, but no one will sell to you. so how do you get this idea that sellers are merely price takers? does your supermarket bargain with you over the price of milk? try walking up to the cashier with a $2.99 carton and saying you want to pay $1 and see what happens. price is where the supply and demand curves intersect. without either, there is no transaction. James says: "From 1800 to 1900 tariffs averaged 30 percent. The highest tariffs in the world. During this time Americans had the highest wages in the world and at the same time the lowest prices." Factors that raised America's living standards, in spite of tariffs, were vast natural resources, technological progress, innovation, etc. The tariff was detrimental to the American people, since it acted to raise the price of goods purchased; anything being bought from overseas which now became more expensive than a local product rose in price to that of the local product, and anything bought from overseas which even with its price increase was still cheaper than a local product had to be bought at the new, higher price. This made the mass of people significantly less wealthy in real terms since everything cost more. This tended to cause an increase in wages, as people required more pay to maintain proper renumeration for their skills, which in turn increased the cost of producing local goods, since the cost of labour rose. This in turn acted to make people poorer. of farm equipment (since wages and imported components were more expensive), it also failed to halt sliding agricultural prices, possibly since there wasn't much competition with imported goods since American agricultural produce was already cheaper than imports. When there is no tariff more money goes outside the country. The harm this does to the country is the value of that money multiplied by the Keynesian Multiplier at that time. This almost always exceeds the savings consumers gain from lower prices because consumer savings is limited to the reduced price with no multiplier. Also with free trade the benefit of lower price goes only to the consumers of the product. Tariffs produce a gain larger than the price reduction and that gain is widely distributed. Free trade imposes a negative stimulus on the economy. As noted above tariffs cause additional costs to consumers such as farmers. The fallacy of the argument is that the economy is more than consumers. Let me carry the free trade argument to the extreme. Many nations are pushing as part of the Doha Round of trade negotiations a thing called the ”movement of natural persons” which is a fancy way of saying that any job may be filled by any person in the world without regard to the nationality of either the job or the person. That is your employer could replace you with anybody in the world. Now consider that for every job in the United States there are at least two English speaking college graduate non citizens. Add in that any foreigner working here gets citizenship for any children born here and when those children reach the age of 18 they can request citizenship for their parents. Under those circumstances how many Americans lose their jobs to a foreigner with a college degree, 10 years of experience, and both willing and eager to work for minimum wage? This Un-Rosy Scenario is a logical extension of the free trade arguments presented here. Preventing someone from taking a job because of immigration restrictions is trade protection just like tariffs, quotas, and regulations. I think I'm beginning to see your problem. I don't know how else to say this, James, but there is no Keynesian Multiplier. If there were, the trillions in "stimulus" spending lately would have the US economy flying high right now. "Also with free trade the benefit of lower price goes only to the consumers of the product." Aren't you forgetting those who benefit from the extra money spent elsewhere by consumers who paid less for the lower priced product? "Tariffs produce a gain larger than the price reduction and that gain is widely distributed. Free trade imposes a negative stimulus on the economy." This is absolutely wrong. Did you consider the formula I presented (copyright morganovich) that showed that a tariff costs consumers the total amount of the tariff times the amount consumed, whereas producers gain only the amount of the tariff times the amount consumed, less the amount imported? Did you not understand that this must always be a net loss in the country that imposes the tariff? "When there is no tariff more money goes outside the country." So what? It must either come back in some form or the imported goods are free. Money isn't wealth.
" which is a fancy way of saying that any job may be filled by any person in the world without regard to the nationality of either the job or the person." Why is that a bad thing? That also means I could get any job anywhere in the world. Your argument seems to be that American workers are inferior to all others, and can't compete, so they need protection. are you sure that's what you wish to say? "Add in that any foreigner working here gets citizenship for any children born here and when those children reach the age of 18 they can request citizenship for their parents. Can I assume this means that there soon won't be any foreigners? You seem worried that soon everyone in the world will be an American. What happens to your protectionist argument then? You also haven't answered my question about why tariffs were necessary at all in the 19th century if America had the lowest prices in the world. James, a tariff is a tax. When you tax something, whether it's goods or immigration, you get less of it. Free trade allows limited resources, including labor, to shift from older industries into newer industries, which creates better jobs. If the U.S. continued to protect farmers, from competition, then most workers would still be farmers. "When there is no tariff more money goes outside the country"
this is not the right way to look at it. when there is no tariff, goods are cheaper and we have more money left to spend on other things. in real terms, this means we are better off. you really need to go back and read the post on tariffs showing their inevitable deadweight loss. read the sugar example ron reposted. you seem to be unable to grasp the idea that tariffs raise prices and higher prices reduce real consumption. even if we believe in keynsian multipliers, they still work better without tariffs. the surplus and multipliers just go to other products. add a tariff, and not only is there a deadwieght loss, but a great deal of consumer suplus is also shifted to government. government has a much lower multiplier than private consumption. so, if you want to make a multiplier based argument, then you really need to oppose tariffs. think about it in terms of that sugar argument. the government winds up with $ = imports X tariff at the direct expense of consumers. even if we ignore the deadweight loss suffered, that is still a big shift of money from high multiplier consumers to low multiplier governement.